After a month of strong rains we still have the heat around and people are back from leave and work is starting to pick up. The good thing is there is still more rain to come. 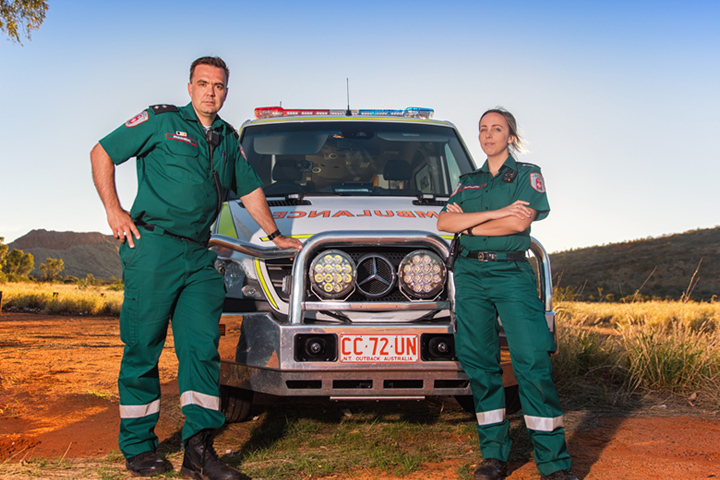 Patient Transport Crew was introduced into the Darwin Region. With these additions to staff, that totals 27 additional team members over the last year and reflects the biggest ever growth in staffing numbers in a 12- month period. I would like to congratulate Frank Dunstan on his 75th birthday but to more importantly thank him for his work on our weekly newsletter – The Vollie News – which during the month celebrated it’s 500th issue. Well done Frank on both events. Each year, thanks to the generous support of Gael Morris, a long-term supporter of St John NT, we reward two Volunteers, in recognition of their hours of commitment to the Community. These volunteers have the opportunity to attend the National St John Ambulance Conference, this year the Conference is being held in Tasmania and the awardees are Christine Turner (Darwin Region) and Kathryn Cooper (Regional NT). Congratulations to you both. We are getting closer to the 2017 Golf Day and initial numbers are good with some spare teams and hole sponsors still available. The support from prize and raffle donors will make for some great prizes and a great day is ensured. If you wish to be a part of this fantastic fundraiser for our Volunteers please give us a call on 8922 6202 or email marketing@stjohnnt.asn.au These and many other stories are featured in the newsletter and we wish to confirm our commitment to you as Territorians that we will continue to strive to make first aid a part of every Territorians life through our Volunteering, First Aid in Schools activities and the Ambulance Service. he 19th February marked a significant date in the Territory calendar. 75 years on from the Bombing of Darwin, citizens from all over Australia including leading dignitaries paid their respects at the Darwin Cenotaph not only for those who lost their lives during that fateful battle but also to those who survived and went on to rebuild our magnificent city. St John members were honoured to be able to pay their respects at this momentous occasion. 21 youth members and 16 adult members represented St John at the event and Volunteer Nam Tang, from the Palmerston Youth Division, wrote how the events of the day affected him. It was a great privilege to be a part of the Bombing of Darwin 75th Commemoration. The bombing marked the first time war had reached Australia, with a very real threat of invasion. The reign of terror that fell from the skies struck fear into the hearts of Darwin and the rest of Australia. Hearing the story of this event furthers my appreciation for the sacrifice of those who lost their lives on that terrifying day, but also to those that despite this, stood their ground and rebuilt this city into the marvellous community that epitomises Australian values of acceptance and diversity. The first week of the month showcased two significant celebrations for our volunteers. The first for the Vollie News, our in-house, (but also distributed much further afield) volunteer newsletter, celebrated it’s 500th issue. The weekly newsletter has been written by our resident Historian Frank Dunstan who also happened to have celebrated his 75th Birthday the same week. We give our heartfelt congratulations to Frank on both of these milestones and thank him for his ongoing commitment each week to produce the Vollie News. The newsletter has proven on many occasions to be a valuable historical reference point and is an invaluable communication tool showcasing some of the many events and antics that our volunteers get up to each week. It is no small task to put together such a comprehensive publication and we appreciate the considerable effort you put in to keeping the content relevant and interesting. Frank has stated that he is willing to do another 10 year’s worth of issues and we look forward to seeing them each week. Congratulations Frank and well done on both counts. This Award was named in honour of Mr Richard Morris AM KStJ, Chairman of the Board for over a quarter of a century. Richard made an enormous contribution to St John and as the first Chairman was the driving force behind numerous successful ventures and ideas including the establishment of the Ambulance Service. As Chairman from 1977-2000 he was instrumental in ensuring that St John became the leaders in first aid services and pre-hospital care. The Award in his honour, is given to members of St John NT Volunteers, who openly display a great Community Spirit. The awards will be presented to members who have completed the most number of public duty hours and also fulfilled the associated selection criteria. The same members are only eligible once every three years. Public Events where duty hours can be counted include the provision of First Aid at Community and sporting events, markets, concerts and Volunteer Ambulance Duties. Given the high level of commitment demonstrated by volunteers across the Territory, there will be two annual awards presented – one for Greater Darwin, which includes Darwin, Palmerston & Humpty Doo and one to include all other regions – Batchelor, Nhulunbuy, Katherine, Tennant Creek and Alice Springs. Gael Morris, wife of the late Richard Morris, has kept his memory alive within St John Ambulance NT by sponsoring the two winners attend the Annual St John Ambulance National Conference. We would like to thank Mrs Morris for her ongoing support and for allowing our valued volunteer members to attend such a beneficial event. The commitment from members this year has again been significant and we congratulate Kathryn Cooper form Alice Springs, winner of the Regional Award with 701 event hours and also congratulate Christine Turner OStJ, for winning the Greater Darwin Region Award with 845 event hours. Both Kathryn and Christine have attended Finke, V8’s, Shows and other sporting events, keeping the community safe through First Aid. Kathryn commenced as a volunteer in 2015 in the Alice Springs Division and is an integral member of the team. Christine began as a volunteer in 1980 and currently holds the position of Territory Officer Training Regional. Well done and thank you to both Kathryn and Christine for the hours you contributed in 2016. Thank you also to all of our Volunteers across the Territory for your ongoing support. Keep up the great work. Sponsorship spaces still available but they're silling up fast! Don’t miss out on Darwin’s biggest golf day and the chance to entertain friends, clients and be a part of the a fantastic networking event. Congratulations to Leona Leonard, winner of the e- newsletter signup competition for January. Leona has won a Personal Motoring First Aid kit valued at $38.50.